A Banini, you ask? Certainly. The magnificent union of a bagel and a hot fresh pressed panini. It’s not only brilliant, but it’s delicious! I was invited for a tasting of a variety of banini, amongst other delicious items at the Brooklyn Water Bagel Company, the brand behind this creation, at their Fifth Avenue Shops location on Federal Highway in Boca Raton. At the age of 13, Brooklyn-born Steve Fassberg trekked from Massapequa, New York to Miami, Florida, hauling bags full of NY bagels in the plane’s overhead compartment. He was bringing the Big Apple staples to his grandparents, whom upon seeing Fassberg exclaimed not “hello,” but “did you bring the bagels? !” Fassberg’s grandparents hadn’t eaten a good one since leaving New York and it was because the quality of water in Florida, they reasoned, didn’t match that of the New York water they had been accustomed to. New York water and its properties created that perfectly crunchy on the outside, soft on the inside combination. The bagel visionary, a larger than life personality, cut his teeth in the world of entrepreneurship earlier than most. During the day, he poured his hours into banking and working with mortgage financing. At night he moonlighted as a restaurateur. By the age of only 21, he had saved up $80,000, just enough to open his very first deli. The Fassberg Kosher Deli in Flushing, Queens, furnished with booths made in Fassberg’s own garage by him and his friends, was opened in April of 1983 to huge success. In 1985, at the age of 25, Fassberg sold the deli for over a million dollars, marking the first of his many highly successful ventures in the restaurant industry. The visionary continued his career in investment banking, all the while opening and selling a roster of fruitful delicatessen and restaurant concepts. One Thanksgiving dinner, a new idea struck. The phrase “It’s all about the water” hit home once again and Fassberg dove into the chance create the perfect bagel, right here in Florida. Brooklyn Water Bagel didn’t spring to life right away. Fassberg dedicated months of research to discovering and creating the perfect bagel, which involved not only the right oven, temperature and baking stone, but also the right water. New York pizza and bagels are so good, he discovered, because of the water. It was the only thing in baking that seemingly couldn’t be kept consistent everywhere, until then. With the help of various water treatment companies and experts, Fassberg discovered what went into the ideal water and what had to go out. He utilized a 14-step system that purified the Florida water by methods like reverse osmosis and reduction of ions, removing from it the chlorine and ammonia present and neutralizing its pH level, among other processes, that would render it “Brooklynized™”. Left: Brooklyn Water Bagel Company Area Manager, Josh aka “Stud Muffin” Westaway. Right: Where all the magic begins – with a proprietary 14-step water filtration process. All of their baked goods, coffees, iced teas and fountain drinks are made using this special filtrated water, and what a difference it makes! Try it and see for yourself. The bagel proofing area. The proofing process takes 45 minutes to an hour and a half, then they are put in the cooler where they will rest overnight and be baked and served fresh within 24 hours. What a spread! The Black Russian bagel is a spin on pumpernickel bread and is made with their dark roast coffee, with or without seeds. Must-try Muffins, L to R: Chocolate Chip, Apple Cinnamon with cinnamon chips, Blueberry, Corn and the Stud Muffin energy muffin (contains walnuts, almonds, blueberries, raisins, flaxseed and wheat flour.) Their muffins were amazing and a whopping 40% bigger than most. The End All Be All in Black & White Cookies. Trust me, you must indulge! Once Fassberg’s water formula was in place, it was time to create the concept which would support a world class bagel product. The next few months were focused on testing menu opinions, Brooklyn design elements and of course the creation of Cubsta “iced coffee” cubes. This is a real treat. Be sure to stop in and try one of their iced coffees using these special coffee ice cubes. You’ll be hooked for sure! After being open only a short time in Delray Beach, Florida, Fassberg had wild success by virtue of the first authentic New York bagel produced outside New York. Armed only with a really great recipe for a bagel and a shared passion for Brooklyn, he was able to land the attention of iconic television and radio host Larry King. Fassberg flew to Los Angeles to meet with King, who couldn’t believe the bagel he was eating was made outside New York. By 2010, moved by Fassberg’s passion for Brooklyn and creating a product so well thought out and unique, King signed on to be Brooklyn Water Bagel’s first franchisee and national spokesperson. Now, the company has 25 location in 6 states around the country, including Florida, North Carolina, Maryland, California, Georgia and Massachusetts. In addition to featuring authentic Brooklyn-style bagels, The Original Brooklyn Water Bagel menu includes egg sandwiches, deli sandwiches, omelets and muffins along with a variety of farm-sourced and artisan-roasted coffee blends. For more info on the company, check out their website. They are open every day from 6am – 3pm. I want to thank my friends at The Gab Group and Josh and Joe at the Brooklyn Water Bagel Company for having myself and my companion in to try out this lovely assortment. Thumbs up on food and hospitality. We will be back! Savor Our City covered some great Delray mainstays on its Taste of Atlantic Avenue tour on Nov. 26. You would think that a restaurant with “Oyster” in its name would only have a decent seafood selection, but the breakfast panini we sampled proved that brunch is also one of this eatery’s prime games. The pesto and mozzarella beautifully complemented the egg and pieces of bacon. The Bloody Mary was scary good – the kind of good that happens when you can barely taste the alcohol in the drink. City Oyster knows how to blend great drinks with delectable entrées. At The Office, we tried the Prime CEO Burger with parmesan truffle fries. The bacon and arugula on the burger brought out the tenderness of the patty, and the fries had all the greasy, truffle-y goodness you could want. The best way to make vegetables delicious is, of course, by adding meat, and the Brussel’s sprouts with bacon turned out to be a great side. Gratitude Garden Farm, located in Loxahatchee, showed our group the benefits of eating microgreens such as sunflower seed sprouts and pea sprouts. These delicious plants would go well in a salad or just as a snack. The siblings behind Frik & Frak Artisanal Sauces offered delicious batches of their homemade tomato sauces, including Holla Vodka and Cognac. The GreenMarket truly showcases the best of what Palm Beach County local cuisine has to offer. Check it out every Saturday through May 20 from 9 a.m. to 2 p.m. at the Old School Square Park. Known as The Arcade Tap Room in 1908, The Old Arcade started out as a secret watering hole for patrons during the Prohibition era. Hidden in and only accessible through Caffe Martier, The Old Arcade offers an exceptional selection of craft cocktails as well as small eats, including goat cheese flatbread. This refurbished speakeasy is a great addition to Delray Beach. At this sweet spot just off Atlantic Avenue, all popcorn is cooked in coconut oil and covered in such ingredients as real cheddar cheese and gourmet Belgian chocolate. The Chocolate Peanut Butter popcorn had the perfect blend of sweet and salty, while the Buffalo Blue Cheese tasted as if I had actually eaten a hot wing. We ended our tour at this crepe eatery based in Pittsburgh. Roast beef and caramelized onions made for a savory and delicious starter crepe, while the CBPB crepe did not disappoint with peanut butter, banana, and milk chocolate chips. If you’re looking to eat some great food in a wonderful small city, the Taste of Atlantic Avenue tour is perfect for both couples and groups. 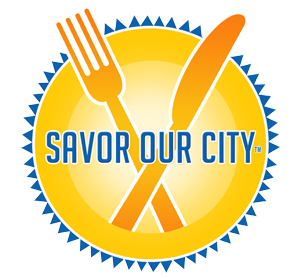 Olivia Feldman is a contributor for Savor Our City. Her favorite foods are anything that involves pasta and her mom’s cooking. When she’s not eating and drinking her way through South Florida, you can find her going to concerts, planning her next travel destination, and hosting her biweekly music show, “Back in Our Minds,” on Jolt Radio. You also can find her on Instagram and Twitter at @oliviafelds All images appearing in this post photographed by Olivia.